Donald Deskey was born in Blue Earth, Minnesota in 1894. In 1912 he left for California with a high school diploma. After a series of jobs, a stint in the army, and attendance at The University of California at Berkeley to study architecture and painting he began working in advertising in 1920, first in Chicago then New York. In 1925 he visited the Exposition Internationale des Arts Decoratifs et Industriels Modernes in France and the Bauhaus in Germany. He came back to New York in 1926 committed to the Modern movement. Deskey created store window displays for Saks Fifth Avenue and made folding screens for Paul Frankl. Frankl paid Deskey $35 per screen plus materials and sold them for $400. Through his work at Saks, Deskey met the company president, Adam Gimbel and showed him some furniture drawings he had made in Paris. Gimbel was impressed enough that he commissioned Deskey to furnish the interior of his Park Avenue apartment, Deskey’s first luxury commission. In 1927 he formed a partnership with Philip Vollmer to be called Deskey–Vollmer, Inc., New York. They produced a variety of lamps and tables using metal, lacquer, and Bakelite. The partnership lasted until 1931. In 1928 he enhanced his reputation as an important Modernist designer with a men’s smoking room he fashioned for The American Designer’s Gallery in New York. He was a cofounder of The American Union of Decorative Artists and Craftsmen (AUDAC) and exhibited in their New York and Brooklyn shows in 1930 and 1931. Starting in 1929 Deskey designed the first of three interiors for Abby Aldrich Rockefeller. In 1930 he designed the interior for critic and writer Gilbert Seldes’ apartment and also the interior of Helena Rubinstein’s Park Avenue apartment. icent setting would further their career and reputation. With only a $1,500 artist’s fee limit imposed on him, Deskey managed to convince many famous artists to decorate the theatre, such as Stuart Davis, Ezra Winter, Henry Varnum Poor, Louis Bouache, Edward Ulrich, Henry Billings, and Witold Gordon. Three statues cast in aluminum were sculpted by William Zorach, Gwen Lux, and Robert Laurent. The mural for the second mezzanine women’s lounge was offered to Georgia O’Keeffe, she refused the commission as $1,500 was an unacceptable fee. An apocryphal story said that her husband, the famous photographer Alfred Stieglitz, was quoted as saying, “Georgia O’Keeffe does not do bathrooms”. Yasuo Kuniyoshi did the mural. While the majority of Deskey’s furniture had been hand made by local craftsmen or commissioned to firms like Schmieg & Kotzian, his acclaim from Radio City Music Hall, the Mandel House, and exhibits at the 1933 World’s Fair brought him to the attention of furniture manufacturers. He designed Modern furniture for Ypsilanti Reed Furniture in the late 1920’s and from 1936-1937 he produced lines for W&J Sloane’s Company of Master Craftsmen, Kroehler Manufacturing, Valentine Seaver, and Estey Manufacturing from 1936 until they closed in 1937. 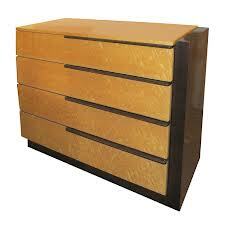 In 1933 he began designing furniture for the Widdicomb Furniture Company, a relationship that would last until 1935. In 1931 Deskey created AMODEC (American Modern Decoration Company) as a line of moderately priced furniture, hoping to attract Americans who could not afford the more expensive Modern lines then in production. Production was in North Carolina, as opposed to Grand Rapids, Michigan and was assigned the Thomasville Chair Company and the Finch Furniture Company, both of Thomasville, North Carolina. A few items were produced by the St. Johns Table Company of Cadillac, Michigan. The line was introduced to the public in rented rooms at New York’s Waldorf Astoria hotel and Chicago’s Blackstone Hotel. At the New York showing 250 pieces of bedroom and dining room furniture were displayed. Later, living room and upholstered pieces were added. Donald Deskey passed away in 1989.